Simple and easy tomato free Caprese Salad. 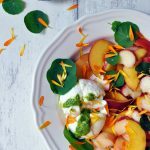 This Low Histamine Stone Fruit Caprese Salad with Anti-Inflammatory Nasturtium Pesto, is just right for these warm sunny days. Tear up the buffalo mozzarella. The nutritional value is calculated based on using basil instead of nasturtium, and off the shelf pesto.